Systems are designed and constructed using the following components. 6mm thick preformed ‘L’ shaped acoustic foam supplied in strips 1.8m long packed in bags containing 100m. The innovative ‘L’ shape makes it easy to fit and one size fits all floors. It is lightly trapped between the bottom of the skirting and the top of the flooring board with the excess neatly trimmed off. 18mm or 22mm Type P5 Moisture Resistant Grade, CE marked chipboard manufactured to BS EN 312 : Part 5. Alternatively WBP Spruce Plywood, CE marked and manufactured to BS 5268-2:2002. All panels are tongued and grooved on all four edges and supplied in sheet size 2400 x 600mm. Peel off layers and protective coatings for chipboard are available. 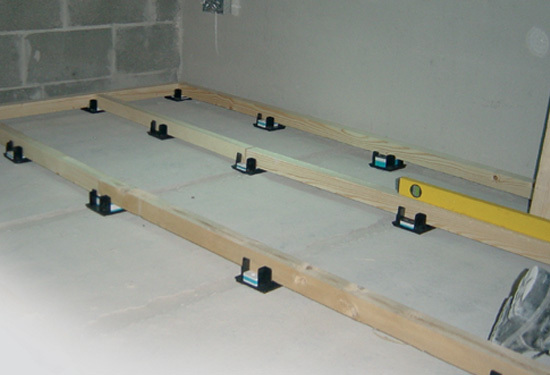 Softwood Support Bearers are placed within the Saddles to support flooring panels. They are 47mm (Nom.) wide and supplied in 1800mm lengths for ease of handling. They are available in 22mm, 36mm, 45mm, 52mm and 61mm heights as standard. In accordance with the recommendations of TRADA Support Bearers are cut from strength graded timber. They are available preservative treated as a special order. Packing is provided by means of innovative, self-locating plastic packers which are made in 3,4,5 and 10mm thicknesses. The unique, patented packers interlock with each other and with the Saddle. They are colour coded for ease of identification and are placed within the Saddle to achieve the levelling of uneven subfloors. 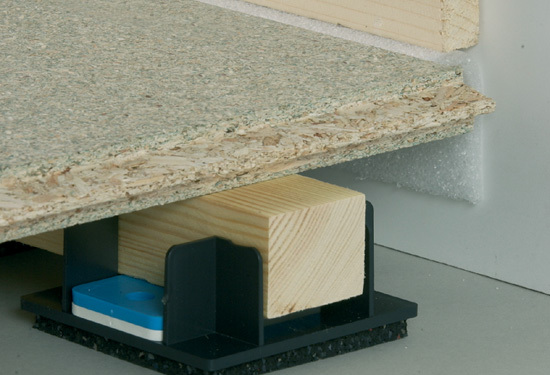 For poor subfloor surfaces the 10mm packers are particularly cost effective. Danskin Acoustic Saddles are 97mm x 97mm square and have a tough, injection moulded plastic headcap adhered to a high performance foam resilient layer. 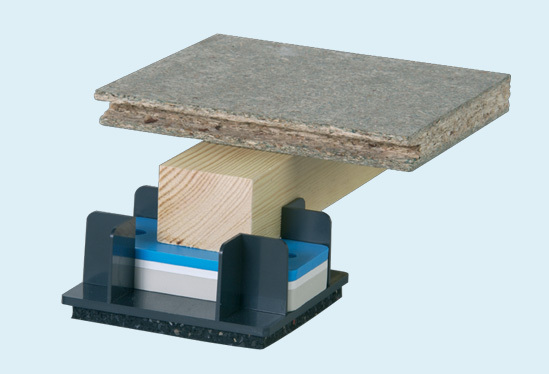 The headcap holds the Support Bearers to which flooring panels are fixed. The saddles are available in three headcap heights (small, medium and large). The small saddle permits 14mm of packing, the medium - 29mm and the large - 40mm. The different headcap heights maximise the packing of the appropriate Support Bearer. Each headcap has two small holes in the surface to lock packing pieces in place. The ingenious design of the head cap means that it can also support cross noggins for access panels or perimeter bearers. The standard height of the Saddle with the resilient layer attached is 11mm. 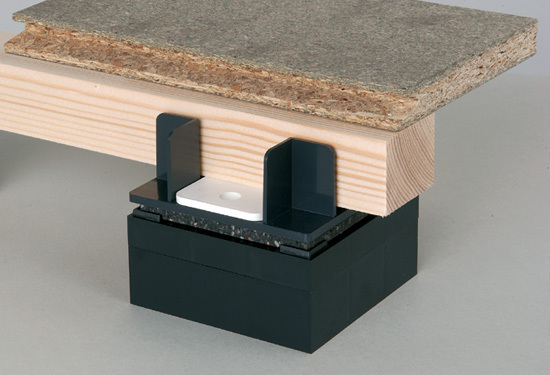 Elevating Blocks are made from injection moulded plastic and they can be placed in combination below saddles where floor variations are extreme up to a maximum height of 150mm. They interlock with the saddles and with each other and extend the height of systems to cope with major deviations in levels. 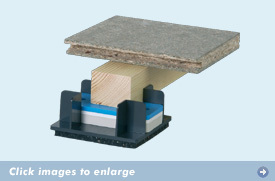 The blocks come in 15 and 30mm thicknesses. As the resilient layer remains on the base of the Saddle in use, the overall acoustic performance is not impaired. Elevating blocks can also be used to raise the system to allow services to run in both directions under support bearers. Contact Danskin for advice if more than 150mm of elevating is required. Where required to achieve a particular acoustic performance Danskin supply acoustic quilt to be laid between the saddles. 25mm thick, the quilt has a density of 36kg/m2 and is paper faced on one side.